Jeanine Connor has over 150 pieces of work in publication, including academic articles, teaching materials and educational texts. She writes regularly for publication by BACP, Curriculum Press, Pearson Education and Zig Zag Education. Jeanine is also Psychology Editor for Curriculum Press and an Examiner for AQA. Depression. Schizophrenia. OCD. Phobias. Relationships. Research. Colin Feltham interviews Jeanine Connor about the impact of violent computer games on young people. 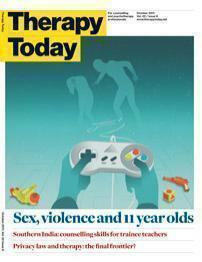 'In conversation with...' by Colin Feltham is published in Therapy Today.